The exciting Hispanic Heritage Festival is back with hot Latin Music and spicy, delicious Latin Food. The sounds of Salsa, Merengue, Mexico, Latin Jazz, Cumbia, and Bachata music will come alive in the biggest 'FIESTA' in downtown Dayton! Admission is free. 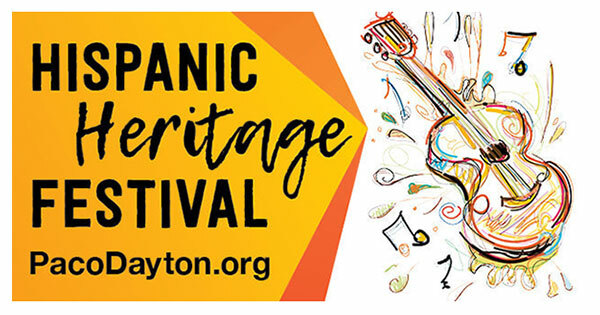 Each year the Dayton region invites those of Hispanic Heritage to come and share their cultures not only with one another, but with the community as a whole at the Annual Hispanic Heritage Festival held at Riverscape. Bands representing various countries’ cultures perform to an audience that can simply sit and listen or can choose to get up and dance! Dance troupes also perform various traditional dances. Foods from Jamaica, Mexico, Puerto Rico, and Peru, among are also available, and vendors will be selling crafts from the various countries as well as flags and t-shirts. Find more events like "Hispanic Heritage Festival"
PACO is dedicated to the success of the Hispanic Community. We are a non-profit organization established in January 1991. Activities for all ages - from concerts to community events to river rentals, to ice-skating and more.